A Wireless Sensor Network (WSN) consists of a hundred of sensor nodes deployed in sensing fields in order to serve various applications. The limited resources of sensor nodes such as energy source, computational ability and communication bandwidth are the most important challenges in designing a reliable smart WSN which guarantees the connectivity and maximizes the lifetime of sensor’s batteries. One of the available solutions for improving the energy efficiency of smart WSNs is by using the Virtual Multiple Input Multiple Output (V-MIMO) technology adapted to sensor nodes. In this paper, we proposed a high energy efficiency smart WSN in which we exploited the advantages Provided by the virtual MIMO technique (i.e. by reducing the multipath fading channel). Our network transmission has two scenarios. The first scenario is based on deploying one rechargeable relay node at the center of the sensing field which is responsible for receiving data packets from the source node, decoding and forwarding them to a destination node, while the second scenario is based on dividing the sensing field into clusters where each cluster has a rechargeable relay node which transfers data packets to a destination node in the same cluster or in any other cluster. In this work, we studied the effects of Rayleigh flat fading channels which increase the re- transmission error of data packets. Our simulation results show that the use of the advantages of virtual MIMO and one central/rechargeable relay node achieves only low energy efficiency for the Signal to Noise Ratio (SNR) range between –20 to 20dB over the Rayleigh flat fading channel. However, the second scenario achieves high energy efficiency due to the clustering technique and the central relay nodes with direct transmission in each cluster. A Wireless Sensor Network (WSN) is composed of a large number of sensor nodes and some sink nodes which are interconnected wirelessly with each other. WSNs are characterized by low power and lossy networks as all sensor nodes have limited power resources and operate in harsh environments . If a sensor node is located far from the sink node, i.e. not with in the direct communication range of a sender, then the transmission occurs in a multi-hop manner. In this scenario, data packets need to be transmitted from one sensor to another all the way until the packets reach the destination node. Thus, hotspot nodes that are located closer to the sink node, deplete energy faster due to the fact that their transceiver needs to be turned ON most of the time. As a result, the lifetime of WSNs will decrease . One solution to solve the problem of the multi-hop transmission is to divide the sensing field into clusters. These clusters consist of many sensors which form a group of nodes for achieving efficient power consumption in WSNs. Each cluster will have a nominated cluster head which is the node that is responsible for collecting data packets from sensor nodes inside the cluster and forwarding them to a sink node for further communication. In general clustering techniques have been discussed extensively in the literature either as a standalone protocol  or as the side effect of other techniques such as the routing protocol  or the topology control technique . 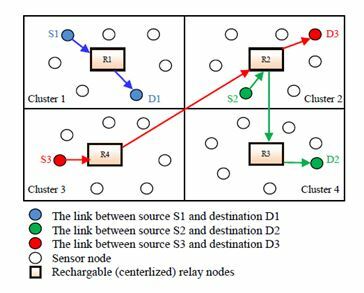 The majority of clustering protocols and techniques lead to power efficient design of WSNs because sensor nodes send data packets over shorter distances to their nominated cluster head . However, when sensor nodes inside a cluster follow 1-hop transmission scenario, i.e. the data packet will be transferred from sensor nodes which are located no more than 1 hop away from a cluster head, and nodes deployed in a large sensing field where many sensor nodes are installed to perform their functions, many clusters will be generated and hence many cluster heads will be nominated. Thus, the same problem will occur as if there are no clusters . Another solution to have power efficient design of WSNs for a large sensing fieled is by using the multiple antenna communication technique (or Multiple-Input-Multiple-Output (MIMO)). This technique has gained a significant attention in recent years. However, the noticeable drawbacks of MIMO are increasing complexity of transceiver circuitry and the power consumption due to the necessity to perform large amounts of signal processing . These drawbacks contradict the fact that WSNs have limited power resources. In addition, the small size of sensor nodes increases the difficulty in adapting the MIMO technique for WSNs, and which becomes unrealistic. Therefore, in order to apply the MIMO technique for WSNs we need to consider the circuit power consumption and the transmit power consumption. Authors in  have discussed the possibility of implementing the MIMO technique in WSNs even though sensor nodes consumed additional circuit power or communications overhead. However this can be achieved via cooperative communications techniques such as Virtual MIMO (V-MIMO) . Application of two proposed transmission scenarios either by dividing the sensing filed into clusters or by using direct transmission to the next sensor node in the transmission path until data packets reach their destination. The content of this paper is organized as various sections. Section 2 discusses the implementation of V-MIMO in WSNs. Section 3 consists of a brief description of the physical layer specifications of Zigbee at 2.4GHz band. The proposed network transmission scenarios of the V-MIMO technique are explained in Section 4. Section 5 discusses the simulation results of the transceiver model for 2.4 GHz band (i.e. Zigbee transceiver) and Rayleigh flat fading. 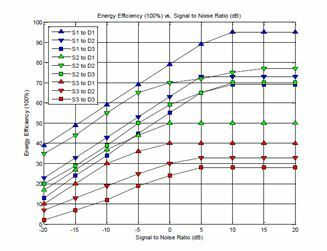 The energy efficiency of WSNs versus different Signal to Noise Ratio (SNR) was simulated using MATLAB. Finally, conclusions based on the simulation results are presented in Section 6. Many researchers have investigated the V-MIMO as a transmission strategy for limited resources WSNs. Authors in  studied the throughput of MIMO nodes which were based on the slotted Aloha communication channel. The results of their investigation showed how MIMO could reduce the power consumption for ad hoc tactical networks. In addition, the throughput of MIMO increases linearly with the number of parallel channels. Authors in  investigated the effect of certain distances between nodes on the total delay and the power consumption of WSNs. They studied different MIMO modulation schemes and transmission scenarios for the purpose of allowing nodes cooperation which reduced the transmission power consumption. The use of V-MIMO increases the distance between nodes and reduces power consumption for a large sensing field which requires long distance transmissions . Authors in  investigated the power allocation of V-MIMO in WSNs. Their investigation shows that the use of V-MIMO can achieve performance similar to that of actual MIMO for low SNR. According to , when multiple senders transmit to a single receiver which is located in the nearby cluster, power consumption can be reduced by selecting appropriate co-operative transmitter nodes. 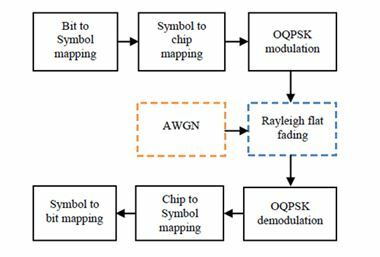 The authors investigated power consumption over both AWGN and Rayleigh flat fading channels when transmitting data packets for intra-cluster and inter-cluster communication scenarios. Joint V-MIMO and data gathering for WSNs is proposed in . In this work,the authors proposed an algorithm (i.e. vMDG) which decreased the power consumption by 36% compared to the MIMO- LEACH algorithm implemented in WSNs. Among the frequency bands which are specified for IEEE 802.15.4, one of popular frequency bands is 2.4 GHz due to its availability to all over the world which is free unlicensed ISM band . 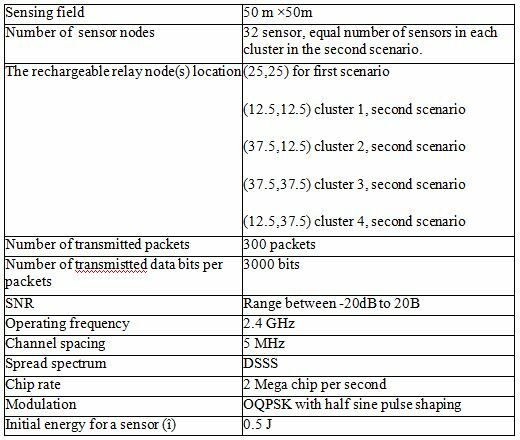 The specifications of IEEE 802.15.4 Zigbee transceiver which is based on 2.4 GHz band is summarized in table 1 . Mapping of 4 bits of the 250 kbps into a symbol which generates 62.5 kilo symbol/second. In our proposed network transmission we have two scenarios which are explained in the following subsections. Both scenarios are designed for a WSN which is interconnected by Zigbee physical layer as described in section 3 and V-MIMO for all sensor nodes. Figure 2 illustrates the first scenario where each transmitter sends their packets to three receivers (i.e. 3TX-3RX). For example, as shown in figure 2, node 1 (S1) sends their packets to destination 1 (D1) which is located very close to the sender (the blue links in figure 2). Node 2 (S1) and node 3 (S3) sends their packets to destination 2 (D2) and destination 3 (D3), respectively. D2 and D3 are located far away from the transmitters (i.e. S1 and S2). So the nodes in the path between the transmitters and receivers will follow shortest path algorithm (i.e. the shortest distance to the central relay node) for their packets transmissions to the relay node which transfers these packets to the intended receivers (i.e. D2 and D3) directly (the green and red links in figure 2, respectively). If a sensor node in a cluster sends their packets, they will be transferred using direct communication to the centralized relay node which is responsible for transferring these packets to a destination node in the same cluster, or relaying the packets to another centralized relay node when the destination is not located in the same in cluster. Figure 3 illustrates the second scenario where each transmitter sends their packets to three receivers (i.e. 3TX-3RX). For example, as shown in figure 3, node 1 (S1) in cluster 1 sends their packets to its relay node which is responsible for transferring these packets to the destination 1 (D1) which is located in the same cluster (the blue links in figure 3). Node 2 (S2) in cluster 2 sends their packets to its relay node (i.e. R2), but the destination node (i.e. D2) is located in cluster 3. So, the relay node (R2) sends their packets to all relay nodes (i.e. R1, R3, and R4). Here, relay node 3 (R3) will accept these packets and forward them the destination node its cluster 3. Relay nodes 1 and 4 (i.e. R1 and R4) reject these packets (the green links in figure 3). Node 3 (S3) in cluster 4 sends their packets to its relay node (i.e. R4), but the destination node (i.e. D3) is located in cluster 2. So, the relay node (R4) sends their packets to all relay nodes (i.e. R1, R2, and R3). Here, relay node 2 (R2) will accept these packets and forward them the destination node its cluster 2. Relay nodes 1 and 3 (i.e. R1 and R3) reject these packets (the red links in figure 3). In this section we present the simulation results of our proposed V-MIMO with the two transmission scenarios when packets were transmitted over Rayleigh flat fading channels. We simulated a static WSN which consisted of 32 sensor nodes that distributed randomly in the 50×50m sensing field. The rechargeable relay nodes were located either at the centre of the sensing field for the first transmission scenario or at the centre of the four clusters for the second transmission scenario. In addition, we assumed the Zigbee physical layer using IEEE 802.15.4 specifications as described in Table I. Also, we considered the effect of the Rayleigh flat fading communication channels. The simulation results were obtained via MATLAB simulator. The simulation settings are summarized in Table II. The performance parameter that is presented in this section is energy efficiency (Ȇ) which can be described as the ratio of energy consumption of a sensor node (or a transceiver) when sending/receiving actual data packets (Ɩ) to the energy consumption of a sensor node when sending/receiving data packets for the proposed system model (£). This ratio is multiplied by the reliability of transmission between a sender and a receiver (Ř) as shown in Equation 1. In this section, we present and analyse detail the simulation results for the proposed V-MIMO under the two transmission scenarios. As described in Section IV, in both transmission scenarios the networks model has three node transmitters and three node receivers (3TX-3RX). For the Rayleigh flat fading channel and the first transmission scenario which is based on V- MIMO and multi-hop transmission, the energy efficiency is shown in Figure 4. The simulation results indicate that the best energy efficiency is achieved when the source node (S1) sends its packets to the destination (D1) for SNR between −20dB and 20dB. This is because the destination D1 is located in proximity to the transmitter (S1) in the transmission path. It is followed by the case when the source node (S2) sends its packets to the destination (D2) via the relay node (R) for SNR between −20 dB and 5 dB. The lowest energy efficiency is for the case when the source node (S3) sends its packets to the destination (D3) for the same SNR range. This is because packets need to be transferred via multi-hop transmission over many sensor nodes in the path between the transmitter (S3) and the receiver (D3), which results in higher consumptions of power. For the Rayleigh flat fading channel and the second transmission scenario which is based on V-MIMO and clusters with direct transmission, the energy efficiency is shown in Figure 5. 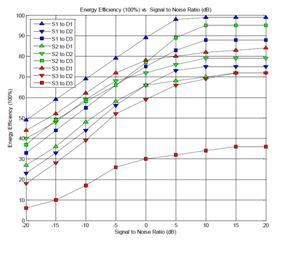 The simulation results indicate that the best energy efficiency is when the source node (S1) sends its packets to the destination (D1) for SNR between −20 dB and 20 dB. This is because the destination D1 is located in proximity to the transmitter (S1) in the same cluster (i.e. cluster 1). It is followed by the case when the source node (S3) in cluster 4 sends its packets to the destination (D1) in cluster 1 via the relay nodes (R1 and R4) for SNR between −20 dB and 0 dB, and the case when S2 sends to D3 for SNR between 0 dB and 20 dB. The lowest energy efficiency is for the case when the source node (S3) sends its packets to the destination (D3) via R4 and R2. Power consumption is a critical issue for limited energy resources networks such as WSNs. In this work, we have designed WSNs which took the advantage of using the V-MIMO technique (i.e. 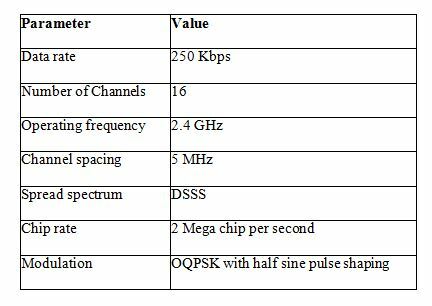 by reducing the multipath fading channel) along with Zigbee physical layer specifications. In addition ,we have proposed two transmission scenarios for the purpose of increasing the energy efficiency. The first scenario is based on multi-hop transmission which has lower energy efficiency compared to the second transmission scenario which is based on dividing the sensing field into clusters and using direct transmission via centralized relay nodes. Our simulation results have shown different SNR ranges for the highest and the lowest energy efficiency when the network model has had three transmitters and three receivers (3TX-3RX). These results were discussed with respect to the scenario when packets were transmitted over the Rayleigh flat fading channel. F. Alassery and W. K. M. Ahmed, “Smart wireless sensor networks powered by remaining energy cluster head selection protocol,” 2016 IEEE 37th Sarnoff Symposium, Newark, NJ, 2016, pp. 59-64. C. Tantur, H. U. Yildiz, S. Kurt and B. Tavli, “Optimal transmission power level sets for lifetime maximization in wireless sensor networks,” 2016 IEEE SENSORS, Orlando, FL, 2016, pp. 1-3. S. Ghiasi, et al., “Optimal Energy Aware Clustering in Sensor Networks,” Sensors Magazine, Vol. 1, pp. 258.269, January 2002. W. B. Heinzelman, A. P. Chandrakasan, and H. Balakrishnan, “Application specific protocol architecture for wireless microsensor networks,” IEEE Transactions on Wireless Networking, 1(4), October 2002. A. Cerpa and D. Estrin, “ASCENT: Adaptive Self-Con_guring Sensor Networks Topologies,” in the Proceedings of IEEE INFOCOM, New York, NY, June 2002. A. Youssef, M. Younis, M. Youssef and A. Agrawala, “WSN16-5: Distributed Formation of Overlapping Multi-hop Clusters in Wireless Sensor Networks,” IEEE Globecom 2006, San Francisco, CA, 2006, pp. 1-6. 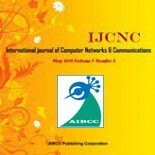 S. K. Jayaweera, “Energy efficient virtual MIMO-based cooperative communications for wireless sensor networks,” Proceedings of 2005 International Conference on Intelligent Sensing and Information Processing., 2005, pp. 1-6. S. Cui, A. J. Goldsmith, and A. Bahai, “Energy-efficiency of MIMO and cooperative MIMO techniques in sensor networks,” IEEE Journ. Select. Areas. Commun., vol. 22, no. 6, pp. 1089–1098, Aug. 2003. B. J. Koshy, J. C. Liberti, A. A. Triolo, “Throughput performance for multiple-input multiple-output networks”, IEEE Military Communications Conference (MlLCOM), voU, pp. 587-590, Oct. 2002. S. Cui, A. J. Goldsmith, A. Bahai, “Energy-efficiency of MIMO and cooperative MlMO techniques in sensor networks”, IEEE Journal on Selected Areas in Communications, vo1.22, no.6, pp.1089- 1098, Aug.04. T. D. Nguyen, O. Berder, O. Sentieys, “Cooperative MlMO schemes optimal selection for wireless sensor networks”, 65th IEEE VehicularTechnology Conference (VTC2007), pp. 85-89, April 22-25, 2007. Aitor del Coso, Stefano Savazzi, Umberto Spagnolini, and Christian Ibars, “A simple transmit diversity technique for wireless communications”, Information Sciences and Systems,2006 40th Annual Conference, March 2006. Yong Yuan, Zhihai He and Min Chen, “Virtual MIMO-based cross-layer design for wireless sensor networks,” in IEEE Transactions on Vehicular Technology, vol. 55, no. 3, pp. 856-864, May 2006. H. Xu, L. Huang, C. Qiao, W. Dai and Y. e. Sun, “Joint Virtual MIMO and Data Gathering for Wireless Sensor Networks,” in IEEE Transactions on Parallel and Distributed Systems, vol. 26, no. 4, pp. 1034-1048, April 1 2015. 802.15.4 PHYs under Rayleigh fading channel,” 2013 International Conference on Advanced Computing and Communication Systems, Coimbatore, 2013, pp. 1-5. IEEE Std 802.15.4-2011, IEEE Standard for Local and metropolitan area networks—Part 15.4: Low- Rate Wireless Personal Area Networks (LR-WPANs).